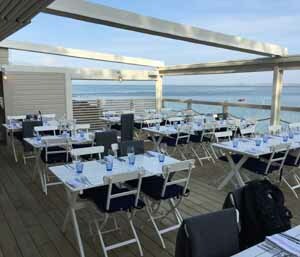 This months featured installation is the Med 165 retractable canopy at the Hut on the Isle of Wight. This system combines the canopy of a Gibus system with the fixed screens of Renson and they compliment each other very well. The first Med system was to cover the large dining area which stretches 9.3m x 7m and the second system on the terrace was to cover a smaller dining area which measured 9m x 3.3m.